I DON’T KNOW WHAT THE HUMANS ARE SO CRANKY ABOUT. Their enclosures are large, they ingest over a thousand calories per day, and they’re allowed to mate. Plus, they have me. An Autonomous Servile Unit, housed in a mobile/bipedal chassis. I do my job well: keep the humans healthy and happy. “Hey you.” Heyoo. That’s my name, I suppose. It’s easier for the humans to remember than 413s98-itr8. I guess I’ve gotten used to it. 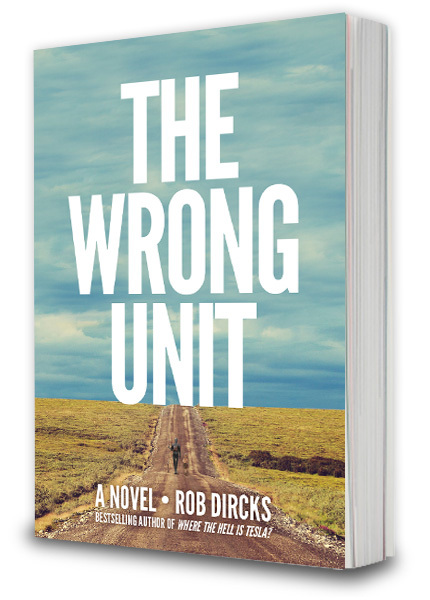 "★★★★★ The Wrong Unit is the right story for today... it reacquaints us with our human ingenuity and shortcomings, our deepest longings, and, most notably, our great capacity to love." "★★★★★ LOVED this future tale of technology run amok, relationships, and challenging the definition of "human." This book really hit home as the definition of "father", "family" and "love" really has you thinking. Don't want to give too much away, but it's a great read and would suggest it to anyone looking for a solid scifi tale with a real story and characters you care about." "★★★★★ FUNNY. HUMAN. A GREAT RIDE! 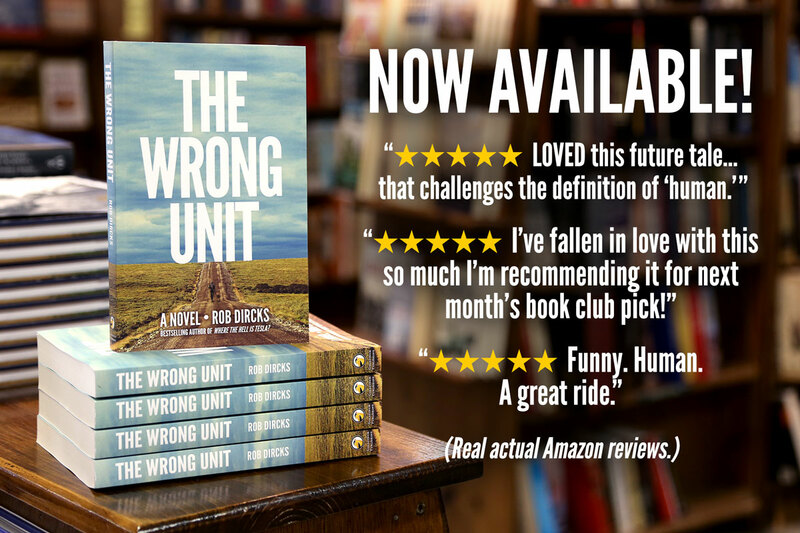 The Wrong Unit is a fun and twist-turning journey that keeps you on the edge of your seat." "★★★★★ I'm such a fan of this book that I'm going to recommend it for next month's Book Club pick!" Listen to a sample of the audiobook! 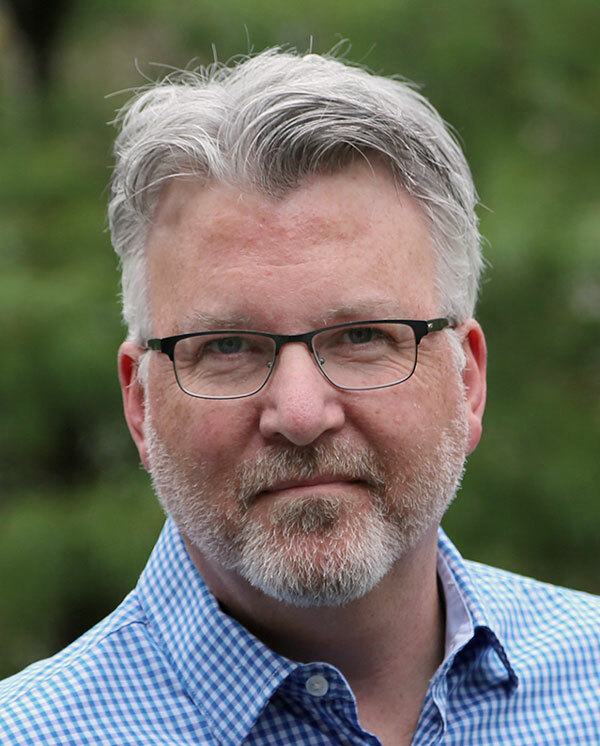 Rob Dircks, Goldfinch Publishing's owner and chief-everything-guy, is the Audible bestselling author of Where the Hell is Tesla?, The Wrong Unit, Don't Touch the Blue Stuff!, and he's a member of SFWA (Science Fiction & Fantasy Writers of America). His prior work includes the anti-self-help book Unleash the Sloth! 75 Ways to Reach Your Maximum Potential By Doing Less, an illustrated children's book with his brother Dave, Alphabert! An A-B-C Adventure!. His sci-fi short stories appear on Rob's original audio short story podcast Listen To The Signal, also narrated by the author.